There are many things I love about the warmer weather. Little things like the laundry drying in the fresh air. The kids playing outside from after school until bedtime. Chillaxing arvos and picnics at the park with friends and family. And, of course, all the clothes. Clothes we’ve not worn for a good 6 months or so, at least here in Victoria. As Spring blossoms into Summer (which is somehow only four or weeks away … already), it’s definitely time to reintroduce ourselves to our skirt-robe, if you haven’t already. And while I tend to gravitate to frocks given any excuse, I do find it hard to go past a pencil skirt. I’d even go so far to say that a printed skirt is a great statement piece to have in your wardrobe, particularly in warmer months. They are easily paired with wardrobe basics to create different looks, making them a super versatile piece. And in this post, I’m showing you how one printed skirt can be styled several ways to create completely different looks. All the looks I’ve created in this post are from my existing wardrobe too, with some pieces that are several seasons old. The only new thing is the skirt. 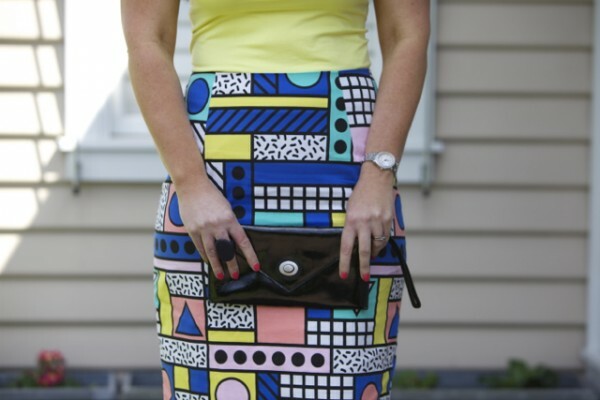 I’m using the pencil skirt above – the Walala Arcade Pencil Skirt from Gorman – as my example. 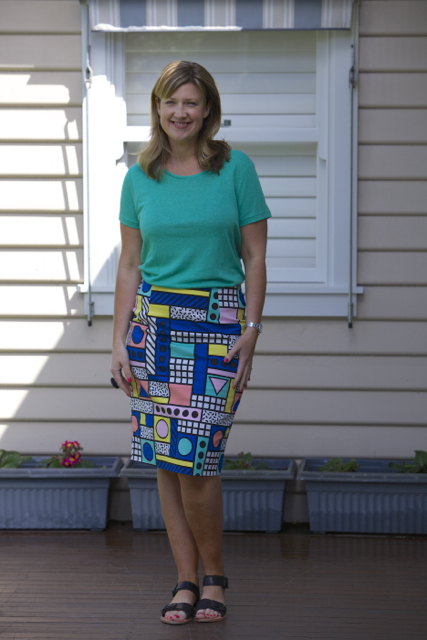 With it’s fun modern print and great colours, this is an easy piece to style. It’s a fairly neat fit – I’m wearing a size 12 but it does give a little with wear. This is a casual combo perfect for days when you don’t want to wear jeans or pants. I’ve picked up the mint in the skirt with this linen tee and added a comfortable, but stylish pair of black buckle sandals, both from Trenery. Gorman have done a similar style to this sandal which you can check out here. I’ve gone the tuck here but it would also work with the tee loose – do whatever suits and works for you. 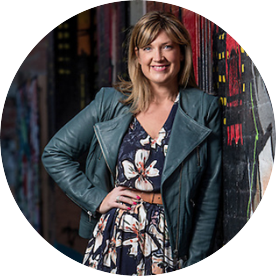 In this outfit, I’ve added a simple black tee from Country Road and black and white wedges from Witchery (both from seasons past). I’ve added some colourful yellow studs from Elm Tree Studio to pick up the yellow and create some interest. This is a step up from casual and would work for lunch with the girls, a family dinner or other smart casual do. Pencil skirts are great for work and look fabulous with a tucked in shirt, as I’ve done below. I picked this shirt up from Sussan a while ago but plenty of retailers stock similar pieces, particular Zara and Target with their affordable work basics ranges. Peeptoe wedges add some height and elongate legs which is always a good thing. Another option for work would be to pair the pencil skirt with a seamless tee and a tailored jacket for a fun take on the “suit”. This is such a simple but effective outfit. It’d be suitable for a range of dressy do’s but it mostly says date night to me. It’s a simple matter of picking up a colour in the skirt for the tank and adding a cropped cardy or jacket. I just happened to hair a neon yellow seamless singlet that I bought from Witchery a while ago, but a black, cobalt blue, white, pink or green equivalent would also work. I picked up this cropped cardy from Alannah Hill a couple of years ago. It’s not a piece I wear often but it’s great to have on hand for warm days/cool nights and looks lovely over a sleeveless top or dress and provides some much needed warmth. It also works back nicely with the black in the skirt, shoes and Mimco clutch bringing the whole outfit together. 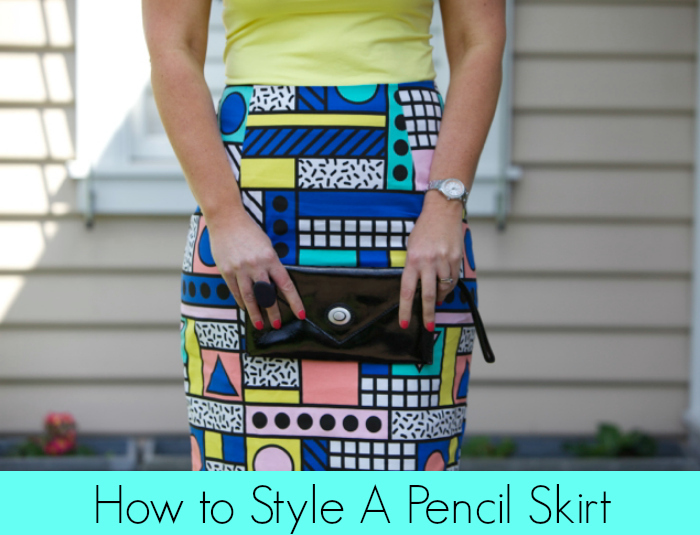 This outfit is another take on how to dress up a pencil skirt. I’ve added a simple jersey top with a pretty sleeve detail from Metalicus and a pair of suede wedges from Seed Heritage (both from seasons past). I’m always on the look out for simple black tops with an interesting detail or flattering cut on hand that complement both my printed skirts and pants. I’m talking tops with a sleeve detail, like this Flutter Sleeve Tee from Country Road one or the gorgeous feathers on this Seed Heritage number. This post contain affiliate links. For more info, please check out my Disclosure policy here. Are you a fan of the printed skirt? A pencil skirt? Or both? How do you style yours?